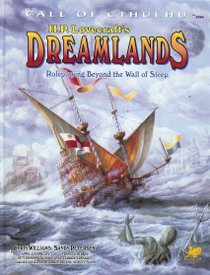 "Roleplaying Beyond The Wall of Sleep"
The Dreamlands book provides the background needed by the keeper to run Dreamlands adventures. Sections include Entering the Dreamlands, New Spells, Dreamlands Creatures, and Dreamlands places. Dream Journeys contains six scenarios, including "To Sleep, Perchance to Dream", "Captives of Two Worlds," Pickman's Student," Season of the Witch," "Lemon Sails," and "The Land of Lost Dreams." 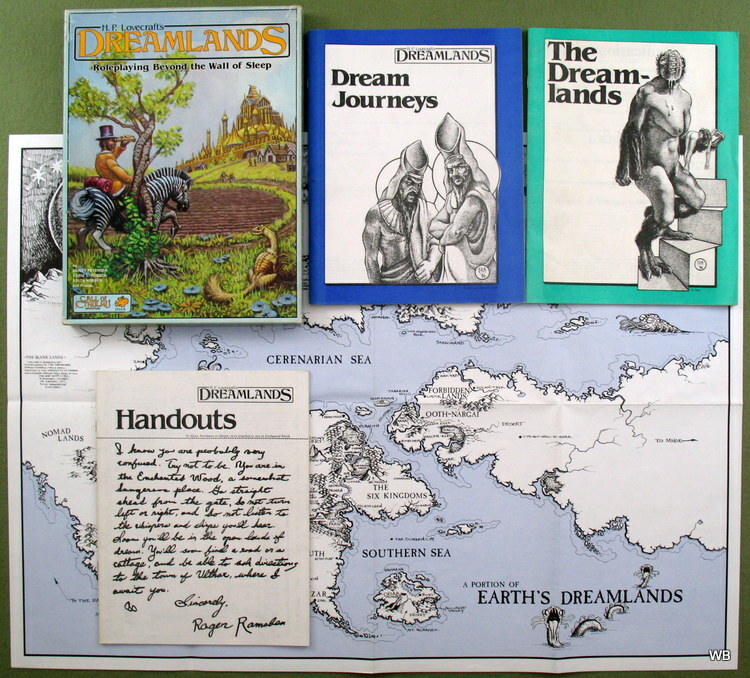 The scenarios can be played in any order, but it is suggested that "To Sleep, Perchance to Dream" be played first, and that "The land of Lost Dreams" be saved until the keeper has some experience with Dreamlands adventures. An intentionally incomplete map of the Dreamlands. The Dreamlands stories traverse only a small fraction of the immensity of dream. Each keeper should feel free to fill the blank areas of the map with cities, kingdoms, islands, and empires. The edges of the map are by no means the edges of the Dreamlands. An 8 1/2 by 11 version of the most visited portion of the dreamlands is provided in the handouts; this can be given to the players after their first trip to the Dreamlands. The handouts include items to be given to the players during the scenarios. Each item should be cut out (cut just to the inside of the dotted line) and given to the players when their investigators have found it. Also in the handouts are a small map of the central Dreamlands and several Call of Cthulu character sheets with the new skills required for dream travel added. The handouts are on the opposite side of this book." "Cthulhu Roleplaying Beyond the Wall of Sleep. TO DREAM: We all dream. Dreams entertain the mind, and help organize the day’s events. At some time in your dreams, you will come across a huge cavern leading enticingly downwards. If you follow it past the Seventy Steps of Light Sleep, it leads to the Cavern of Flame. There dwell two hoary Priests Nasht and Kamen-Thah, who judge all dreamers and, if they find them worthy, admit them to the Dreamlands. The door opens, and all the world beyond is a dream. There is much unearthly beauty, and cosmic great terror. If you live here long enough, and gain sufficient skill, you can learn to create new objects, new life, and a new reality. 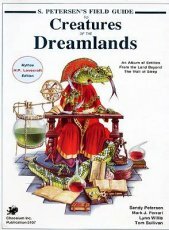 THE DREAMLANDS: This book provides everything needed by the Keeper to run Dreamlands adventures. The Dream Journeys section contains six scenarios including To Sleep Perchance to Dream, Captives of Two Worlds, Pickman’s Student, Season of the Witch, Lemon Sails, and The Land of Lost Dreams. Also included is a map of the Dreamlands. A version of this map in included in the handouts, to be given to the players after their first trip to the Dreamlands. Finally, the Handouts are items to be given to the players during the scenarios. As a bonus, a variant of the Cthulhu character sheet is also provided which includes the new skills required for dream travel. You are permitted to photocopy this sheet for personal use." "An Album of Entities From the Land Beyond The Wall of Sleep. "Ethereal and haunting, life in the Dreamlands is distorted and slightly unreal. Unearthly beauty thrives, as does cosmic terror. All the world is a dream." "We all dream. For some, dreams can become reality. This book provides everything needed for Call of Cthulhu investigators to travel down the seven hundred steps through the Gate of Deeper Slumber and into the land of dreams. It includes a travelogue of the Dreamlands, a huge gazetteer, statistics for over thirty prominent NPCs, a bestiary of over sixty monsters, information on the gods of the Dreamlands and their cults, a fold-out map, and more. Also pre sent are two adventures, Lemon Sails and Pickman's Student, to help get keepers started adventuring in the Dreamlands. 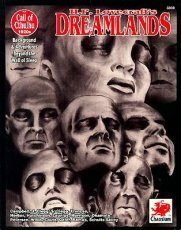 This fourth edition of the Dreamlands is much larger than previous editions, with almost a hundred pages devoted to new background material and a character generation system. 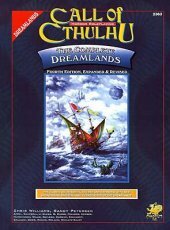 You can now choose to visit the Dreamlands, or stage a campaign there." "Nyarlathotep. The Crawling Chaos. Messenger of the Outer Gods. He has a thousand masks and a thousand schemes, and one of them begins here. When Byron Humphrey found the Dreaming Stone in the tomb of an Incan priest, he could not have imagined that it would embroil him in the plots of Nyarlathotep. Now, he and the investigators must fight not only for their lives, but for their very souls. 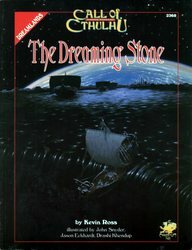 The Dreaming Stone is set primarily in H.P. Lovecraft's Dreamlands. There, the investigators will travel through many realms of wonders. The Temple of Loveliness at Kiran, the Jungle of Kled, the Great Library of the Dreamlands, the desolate Forbidden Lands, and the Far Side of the Moon are just a few of the stops in this epic campaign. Will the investigators be able to halt Nyarlathotep's plan before it is too late?" "We all dream. For some, dreams can become reality. This book provides everything needed for Call of Cthulhu investigators to travel down the seven hundred steps, through the Gate of Deeper Slumber, and into the land of dreams. It includes a travelogue of the Dreamlands, a huge gazetteer, statistics for over thirty prominent non-player characters, a bestiary of over sixty creatures, information on the gods of the Dreamlands and their cults, a colorful fold-out map, and more. Also present are six adventures to help get keepers started adventuring in the land of Dream." 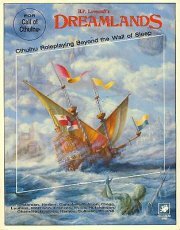 Chaosium owns (and holds trademark to) the Call of Cthulhu in all forms.